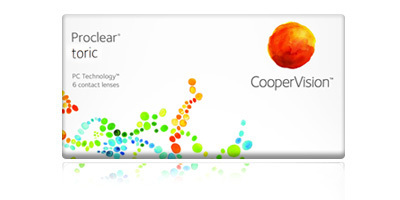 Affordable, durable and effective when it comes to supplying constant vision quality, CooperVision Proclear Toric monthly disposable contact lenses offer outstanding value for money. They correct astigmatism, offer relief for sufferers of dry eyes, and support eye health through biocompatible moisture technology. They offer sharp vision and all-day comfort, even after 12 hours of continuous wear. 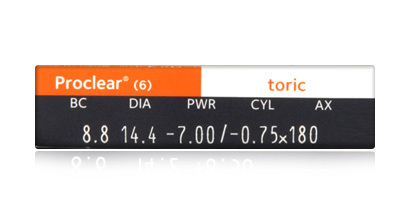 Proclear Toric lenses retain up to three times more water than similar products. It�s all thanks to CooperVision�s sophisticated PC Technology. This hydration system features hydrophilic molecules, which copy the effects of the eye�s cells by naturally attracting and holding water. As water is bound to the surface of the lens, a protective layer is formed which resists protein and deposit build-up. PC Technology allows for a more natural and comfortable lens wearing experience. Higher levels of water retention also allow the eye to breathe better, as more oxygen can travel through the lens to the cornea. 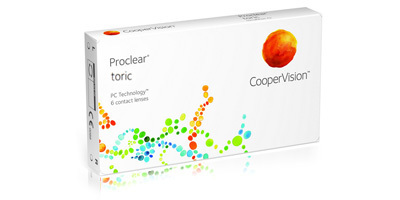 Proclear Toric are one of the most breathable monthly disposables available and effectively combat uncomfortable dryness caused by features of modern life like air conditioning and traffic pollution. A slight blue tint makes Proclear Toric lenses easy to see in the blister pack and on the tip of your finger. Three lenses are included in each box. Call one of our friendly and knowledgeable advisors free on 0800 037 4000 for any advice on selecting the correct contact lenses for your vision. It would also be helpful if you had a copy of your contact lens prescription to hand. ContactLensesExpress offers express delivery to home and work addresses with 98% of orders despatched on the day they are placed. Brilliant service. Speedy delievery of a quality product. I love the reorder facilty, it just makes life that much easier. Thanks for a great service.